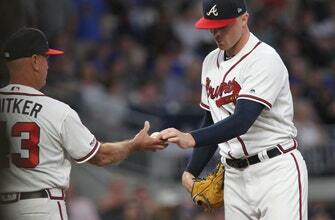 ATLANTA (AP) — The Atlanta Braves‘ pitching staff has taken a couple of hits with starter Sean Newcomb sent down to Triple-A Gwinnett and closer Arodys Vizcaino put on the injured list. Newcomb, a fixture in the rotation since June 2017, couldn’t hold a 4-0 lead in the Braves’ win Saturday over the New York Mets and was pulled after allowing five hits, four runs and two walks in 1 1/3 innings. Vizcaino is sidelined with right shoulder inflammation. He has been injured several times in his career and felt pain while warming up Saturday night. Newcomb, a former first-round draft pick who came within one strike of a no-hitter last July, struggled badly in spring training, allowing 17 hits, 12 runs and 15 walks in 21 innings. He has struggled to consistently attack the strike zone even though the Braves are confident in his stuff. Touki Toussaint, who pitched six strong innings in relief of Newcomb, will take his spot in the rotation. Snitker hopes ace Mike Foltynewicz, on the injured list since the start of the season with a right elbow spur, has solid results in his third straight rehab appearance Monday with Gwinnett. A.J. Minter moves into the full-time role as closer with Vizcaino shut down. Vizcaino has 50 saves in his last five years with Atlanta, but he underwent elbow ligament replacement surgery in 2012 and was sidelined twice with shoulder inflammation last year.